This is what I came up with. Over twenty-five students just loved it, made them as holiday gifts, and learned several useful techniques in the process. 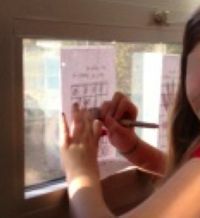 First, Sketch and then draw your design on graph paper; use a window to trace the design onto the graph paper if desired. Second, add colors using markers or crayons. Next, Apply the white, one-inch tiles to Masonite squares that have been cut slightly smaller than the finished trivet will be. Mark the centers with a T so that the students can start from the middle and get them onto the boards straight. Have them use good glue (we used Elmer’s all-purpose, not “school glue”) to put them on the boards, making sure that they are very tightly fit together. Let dry overnight or longer. The final step, have the students transfer their own designs to their prepared trivet boards using permanent ink Sharpie markers in vibrant colors. The bottom of the board can also be covered with felt squares cut to fit to protect the table. NOTE: There is virtually no spray-on, clear-coat finish that is heat resistant that I have found, so if the recipient of the project is not aware of how to take care of it, perhaps it should just be a tile decoration.